Panoramic imaging is a progressive application and research area. This technology has applications in digital photography, robotics, film productions for panoramic screens, architecture, environmental studies, remote sensing and GIS technology. Applications demand different levels of accuracy for 3D documentation or visualizations. Part One contains a full introduction to panoramic cameras and laser range-finders, including a discussion of calibration to aid preparation of equipment ready for use. 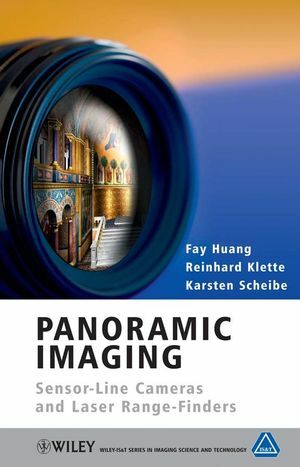 Part Two explains the concept of stereo panoramic imaging, looking at epipolar geometry, spatial sampling, image quality control and camera analysis and design. Part Three looks at surface modelling and rendering based on panoramic input data, starting with the basics and taking the reader through to more advanced techniques such as the optimization of surface meshes and data fusion. There is also an accompanying website containing high-resolution visual samples and animations, illustrating techniques discussed in the text. Reinhard Klette is currently a Professor and Chair in Information Technology at the University of Auckland, New Zealand. He is an experienced author, having already co-written the books Digital Geometry: Geometric Methods for Digital Picture Analysis (Morgan Kaufmann, 2004), Computer Vision: Three-Dimensional Data from Images (Springer, 2001) and Handbook of Image Processing Operators (Wiley, 1996), and co-edited the books Geometric Properties for Incomplete Data (Kluwer, 2005), Performance Characterization in Computer Vision (Kluwer, 2000) and Geometry, Morphology, and Computational Imaging (Kluwer, 2003). He has also co-authored over 80 journal papers, and over 160 conference papers. He teaches courses in Picture Processing and Analysis and Computer Vision and his research interests are in shape recovery and scene/object visualisation based on captured pictures/video, geometric subjects relevant to picture analysis and computer vision, and applications of picture analysis/computer vision. Fay Huang finished her PhD on the geometry and applications of rotating line cameras in 2002. She was supervised by Reinhard Klette at the University of Auckland, New Zealand. Karsten Scheibe is currently completing his PhD on combining laser range data with images captured by rotating line cameras. He is involved in major projects in Germany using this technology, such as a full 3D reconstruction of castle Neuschwanstein based on 1800 laser scans and hundreds of panoramic images for texture mapping. 8. Sensor Analysis and Design. 9. 3D Meshing and Visualization. Panoramic Imaging Visit for high-resolution visual samples and animations which illustrate techniques described in the text.